Animators have an important job in any video game or film studio: to create living, breathing characters who express their unique personalities through movement. It is a complex and challenging task, but the results can be nothing short of breathtaking. This Online Workshop introduces you to the art and science of animation through hands-on projects that show firsthand how each step of the production process works. You will learn about the tools and techniques professional animators use while creating their own 2D and 3D animations. Along the way, you will discover how traditional art skills, including drawing and sculpting, are central to the animation process. *To make up for the Fourth of July holiday, hours during this session are extended one half hour. Each 30-Hour Online Workshop is a hybrid class that uses a combination of online classroom sessions and offline study. Each session includes 30 hours of online class meetings via Zoom, where students interact with their instructor in real time, as well as independent studying and projects. Students communicate with instructors and classmates through live internet chats during online sessions, as well as through email and message forums. Students have access to reference material, schedules, and assignment postings through an interactive distance-learning website. Animators have an important job in any video game or film studio: to create living, breathing characters who express their unique personalities through movement. It is a complex and challenging task, but the results can be nothing short of breathtaking. This Online Workshop introduces you to the art and science of animation through hands-on projects that show firsthand how each step of the production process works. You will learn about the tools and techniques professional animators use while creating their own 2D and 3D animations. Along the way, you will discover how Art skills, including drawing and sculpting, are central to the animation process. Each 30-Hour Online Workshop is a hybrid class that uses a combination of online classroom sessions and offline study. Each session includes 30 hours of online class meetings via Zoom, where students interact with their instructor in real time, as well as independent studying and projects. Students communicate with instructors and classmates through live internet chats during online sessions, as well as through email and message forums. Students have access to reference material, schedules, and assignment postings through an interactive distance-learning website. Whether working with human-based characters or fanciful creatures, the animator’s primary job is to convey the characters’ thoughts and emotions through their physical actions. In Art and Animation Level 2, students learn about the character design and animation processes while exploring modeling and animation techniques using 3D computer animation software. Throughout the workshop, students will learn about traditional art and animation concepts used by successful character animators. This Online Workshop teaches you how today’s digital games and interactive experiences are created. 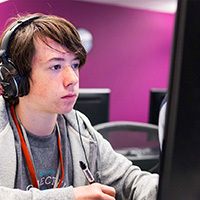 You will make a series of games while learning basic programming concepts, immersing yourself in the game production process, and exploring pathways into video game careers! *Please note, there will be no workshops on the July 4th holiday. Workshop hours will be extended 30 minutes during this session. 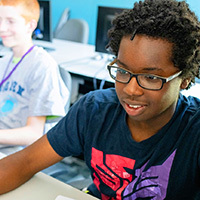 In this workshop, students focus on the tools and processes game designers use to create compelling video game levels, interesting scenarios, and enjoyable playing experiences. Students discover how to create dynamic sequences and events and bring their levels to life. 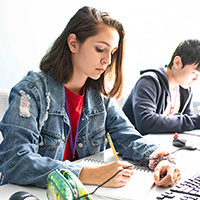 By the end of this workshop, students will have a greater understanding of the work of professional game designers, as well as the ability to create their own game designs. This Online Workshop allows you to dive into the process of writing code for video games! You will learn the basics of Java programming, such as variables, conditionals, and functions, in conjunction with the basics of video game programming, including animating sprites, controlling character behaviors, and applying sound effects! Building on the Java programming skills gained in Level 1 of this series, you will focus on understanding the crucial computer science, computer graphics, and mathematical concepts of how 2D game engines are created. This challenging course pushes you beyond being simply a user of technology and puts you on the path toward creating it. Each 30-Hour Online Workshoup is a hybrid class that uses a combination of online classroom sessions and offline study. Each session includes 30 hours of online class meetings via Zoom, where students interact with their instructor in real time, as well as independent studying and projects. Students communicate with instructors and classmates through live internet chats during online sessions, as well as through email and message forums. Students have access to reference material, schedules, and assignment postings through an interactive distance-learning website.